Die Schmetterling is an Austrian Folk Band and they were popular in the 70s and early 80s. The band was founded in 1969 and the original members were Willy Resetarits, George Hernnstadt, Fredi Rubatschek and Erich Meixner. In 1970 Brigitte Schuster joined the band but in 1971 she was replaced by Pippa Armstrong. Fredi also left the band and was replaced by Herbert Zöchling-Tampier. In 1976 singer Beatrix Neundlinger joined the band, she was also a member of the Milestones who represented Austria at the Eurovision Song Contest in 1972 with the song Falter Im Wind. The band was quite popular and they performed a lot on folk festivals throughout Europe. 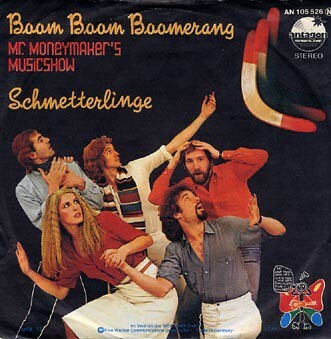 In 1977 Die Schmetterlinge represented Austria at the Eurovision Song Contest in London with the song Boom Boom Boomerang which finished 17th. The song is one of the more controversial entries in the ESC history, the lyrics were satirical and more of a parody of the ESC . The performance was also memorable, as the band featured four male singers wearing white suits and red shirts. During the performance, the men would turn their back to the audience revealing a costume which looked like the front of a toledo complete with a fake face. A performance like this had not been seen at the Contest. In 1979 the band released an LP with political songs and they sang the theme tune of a German movie. Today the band performs only sporadically.